So this is the complete kit before I took it out and set everything up. I know iPhone cameras can be deceiving, but everything is actually this really gorgeous emerald green color that I completely adore. The packaging was so cute to begin with, it comes in a little box with a flip top so you can see all of the products without taking them out first. 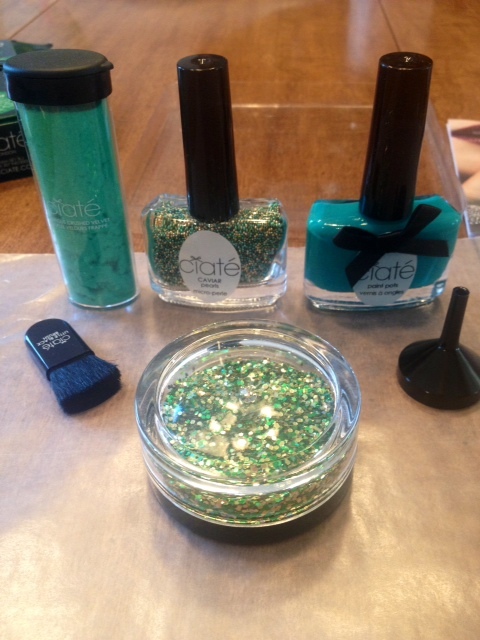 Inside you have an emerald polish, caiver beads (those little beads in the polish jar at the left), a jar of glitter, light green feather-ish material, a brush, and a funnel. Here is everything set up for ya. I ended up using everything but the light green, feather-ish material. I put it on one nail, but it was extremely difficult to apply and actually looked quite horrible, so I took it off and probably won’t be using that again! And, as you can tell, I have wax paper set out underneath everything, which I 100% suggest because with the glitter and the little beads, things are gonna go everywhere! The brush, which I didn’t end up using, is for evenly distributing the glitter or beads around your nail, but I found you could do that yourself just by pressing down as everything was drying. The funnel, of course, is for putting the little beads back into the jar easily! Warning: my nails are a little sloppy because I always wait until the very end to clean up and wipe off polish that got on my skin. So, sorry about that, just ignore it! Anyway, this is that gorgeous emerald color. You do two coats of this (you can do more if you want more color payoff, but two should work just fine) and, while your second coat is still wet, that’s when you start applying the caiver beads and the glitter. I did the caiver beads first and I loved them! They’re actually extremely easy to apply. While your nails are still wet, as I mentioned above, you just dump the beads out over your nails, over wax paper of course! It also helps if you do it over a tray or something with edges which will keep the beads from flying all over the room. As you dump the beads on your nails (I just did my two focus fingers), they’ll instantly adhere to the wet polish. 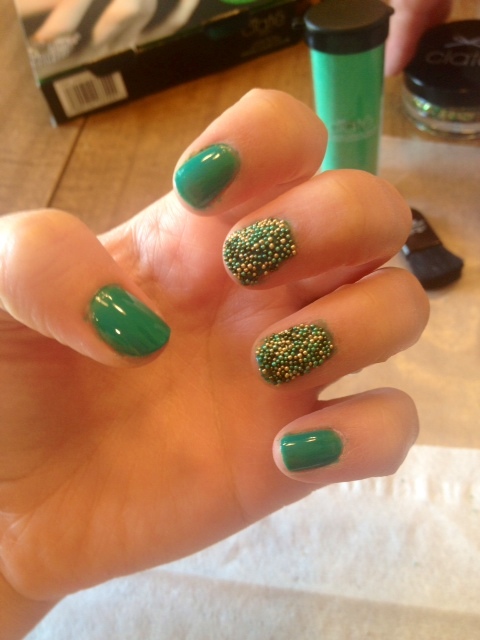 Shake of the excess beads and then gently press down to really get them into that polish so they’ll stick longer. 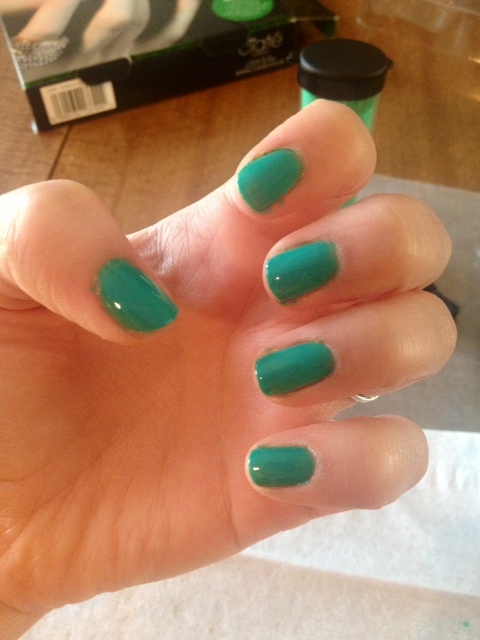 After it dries, go over with a clear top coat. This is the glitter, my favorite part! 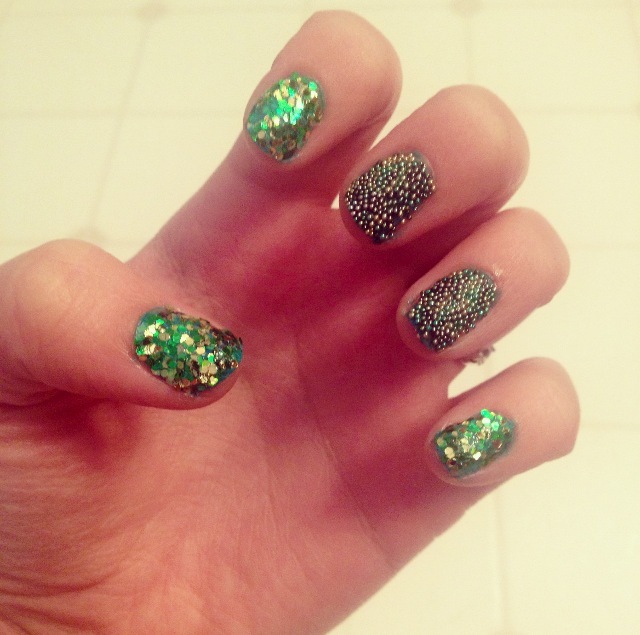 I love it because I think it looks like fish scales… I’m not crazy, right? haha All you do is, when the polish is still wet, you dip your nail into the glitter jar and, BOOM, you’ve got gorgeous, fish nails! Dump of the excess, gently press down, and apply your top coat! Here’s the finished product, all cleaned up and ready to go! Don’t be intimated by this, it only took me about 30 minutes, maybe less! It was super easy to do and the pay off was great and well worth it! I got tons of compliments and questions about everything. I hope you guys enjoyed this quick, little tutorial and I hope you’re as fascinated by this nail art as I am! haha Thanks for hanging out with me tonight, I’ll talk to ya tomorrow! Thank you so much, girl! And I for sure will go check it out (: Thank you for reading! Thank you so much! 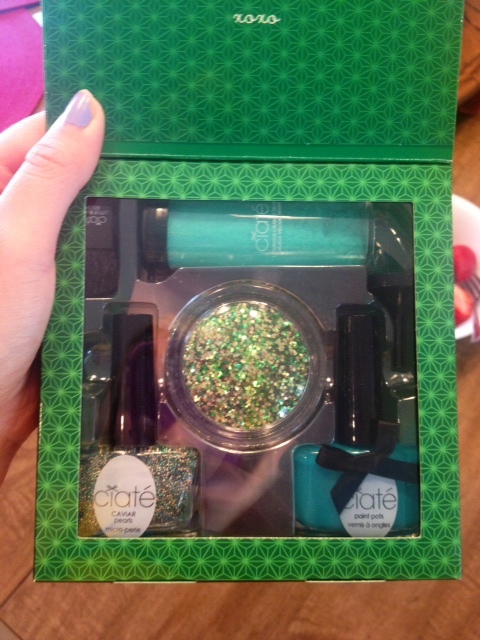 You defiantly need to do a blog post and let me know if you get a nail kit like this! Happy early birthday!! Awhhh! You’re seriously too sweet. I’m so glad I found your blog, I think you’re amazing. Thank you for always being so kind and supportive! !